In the picture the man is lying down 'in the doghouse.' Can you guess the meaning of this idiom? In the doghouse: in trouble or in a situation where someone is upset or angry with you for some reason. This idiom is most often used to describe a man who has angered his girlfriend or wife. A dog house is a small shelter with a roof that's made for a dog. It's the place they sleep if they live outside in someone's yard—it's their usual place to say and not related to punishment. 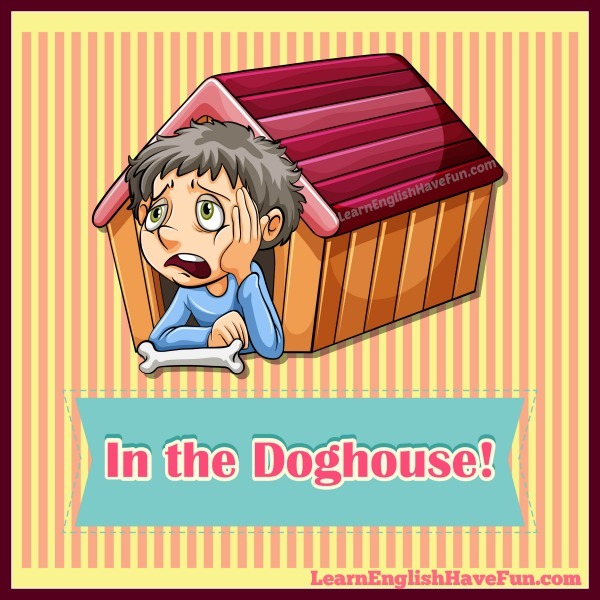 However, this idiom is figuratively saying the person is so angry with them that they would like to put them in the dog's house to stay awhile because they have acted like a bad dog. (Again, the person is not literally put into the doghouse). I'm in the doghouse with my wife again for staying out until 3 AM last night with my buddies and not calling to say I'd be late. I got tired of being in the doghouse with my ex-girlfriend all the time. Honestly, I never knew why she was so upset half of the time. We didn't do our chores so we're in the doghouse again. I forgot to tell my boss that his newest client had called twice so I'm really in the doghouse. I've got to get going now or I'll be late picking up my wife—and I really don't want to be in the doghouse. My boyfriend completely forgot my birthday so I put him in the doghouse and refuse to speak with him. My dad's in the doghouse with my mom again because he's just been sitting on the couch watching television all weekend rather than helping her with any of the housework. My parents would put me in the doghouse if I kept my bedroom as messy as yours! Keep talking to me in that tone of voice and you'll be in the doghouse for the next month! You look so depressed! Did Jane put you in the doghouse again? I forgot our anniversary so now I'm really in the doghouse with my wife. I had to put my boyfriend in the doghouse because he has been spending all of his time with his friends and ignoring me. I'm in the doghouse with my parents because I skipped school yesterday. My sister put her boyfriend in the doghouse again after she noticed him talking to one of the cheerleaders during our lunch hour. Tomorrow's mom's birthday so get her some nice flowers or you'll be in the doghouse again. If you found this idiom useful, why don't you sign-up for my free newsletter so you can find out about new updates to my website? Practice your English by writing an example sentence in the comments box below. It will help you more easily remember this idiom in the future.